Smt K Neeraja Smt K Neeraja, a senior faculty at Shankarananda Kalakshetra , was trained in Bharatanatyam by Ananda Shankar Jayant. Having joined Shankarananda Kalakshetra at the age of 5 years, Neeraja, was one of the star disciples of the institution and went on to win many prizes, including the Silver and Gold medals at the All India Competitions for dance. After an Arangetram at a very young age, Neeraja continued to perform as a soloist as well as essaying major roles in the productions of the institution. After taking a break to get married and raise a family, Neeraja, is now back at Shankarananda Kalakshetra, pursuing her passion for dance by teaching both senior and junior levels at two of our branches. Patient yet unrelenting, Neeraja, is much loved by young students as she pushes them to reach for perfection in theory and practice. Smt P Manjula Smt P Manjula, has been associayed with Shankarananda Kalakshetra since 1984 – first as a student of Bharatanatyam, then as a performer in the repertory and now as a dedicated teacher. After studying for eight years, Manjula performed her Arangetram. 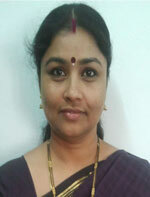 As an active member of Shankarananda Kalakshetra, Manjula has essayed many roles in some of the earlier productions of Shankarananda Kalakshetra. 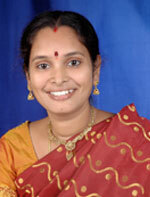 Her role as Kalinga in Sri Krishnam Vande Jagadgurum , was praised by critics and layman alike. After taking a break to get married and raise a family, Manjula, came back to teach at the Secunderabad branch of Shankarananda Kalakshetra, where she devotedly trains, beginners and junior students, with patience and love. After moving to Hyderabad to pursue a career as a software engineer, in Microsoft R&D , Sneha joined Shankarananda Kalakshetra, to further hone her talent. She continues her advanced training from Ananda Shankar Jayant, and also handles the Madhapur branch of Shankarananda Kalakshetra. Krithika, has been part of the ensemble that was sponsored by the Indian Council for Cultural Relations (ICCR) for dance performances at Corfu Festival, Greece, Syria, Edinburgh Festival - UK and Festival of India in Russia , Festival of India in Brazil, and Festival of India in Jakarta, Indonesia. 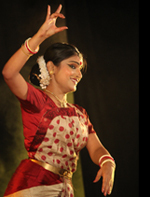 Kirthika, is an emerging solo dancer with performances as a soloist , including the inaugural performance at Krishna Gana Sabha. Krithika, also had the unique opportunity to dance at the Rashtrapathi Bhavan, New Delhi, in the presence of the President of India, and other dignitaries in honour of the visiting Russian President. A graded artiste of Doordarshan, Krithika is the recipient of the Big Rising Star Award presented by the Big CBS Group, and the Young Achievers - 2012 Award for Excellence and Achievements in Dance Presented by Public Relations Council of India (PRCI). An Electronics Engineer , Krithika is also a faculty member at Shankarananda Kalakshetra, training beginners and juniors at the Film Nagar studio.